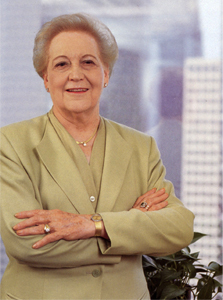 A fourth generation Houstonian, Elizabeth Rockwell was a longtime friend and philanthropist of the University of Houston. Rockwell served as Executive Director, Private Client Division of CIBC Oppenheimer Corp. and was widely recognized as an expert in retirement, estate, investment, and tax planning. She died on Friday, Jan. 28, 2011. The ERISA legislation passed by Congress in 1974 added a new depth to her career. In 1975 she testified before the House Ways and Means Oversight subcommittee to help probe the problem areas of IRAs and was asked to comment on proposed regulations before the Internal Revenue Service. In 1978, a speech she had written was printed in the Congressional Record. This was done at the suggestion of the staff of the Joint Committee on Legislation because it pinpointed the problems created by institutions unfamiliar with the IRA rules and regulations. Her work in this area singled her out with national recognition. Elizabeth served on the Board of Governors for the Houston Forum, on the Advisory Council of the Greater Houston Women’s Foundation, on the UH Bauer College of Business Foundation, on the UH Bauer College of Business Dean’s Advisory Board, on the UH Cullen College of Engineering Leadership Board, on the UH Law Center’s Health Law Policy Institute Board, on the Center for Public Policy’s Board, on the Finance Committee of the Houston Alumni Organization’s Board, and on the University of Houston Foundation Board. She formerly served as a Board member of the American Red Cross, the Greater Houston Preservation Alliance, the Houston Community College Television Advisory Board, and the UH Planned Giving Council. She is a member of the River Oaks Business Women’s Exchange Club, the National Tax Sheltered Annuity Association, the Texas Association of College Teachers, and the Houston Association of Life Underwriters. Among her numerous honors, she received an Honorary Doctorate of Humane Letters from the University of Houston, the Distinguished Alumna Award from the Houston Alumni Organization and from the UH Bauer College of Business, and the Distinguished Service Award from the Health Law Policy Institute. Throughout the years she was recognized for her many achievements by the Education Foundation of Harris County, the Houston Community College System’s Television Station Advisory Council, the Houston Mayor’s READ Commission, the Freedoms Foundation of Valley Forge, the Greater Houston Women’s Foundation, the Asian American Women’s Forum, the American Business Women’s Association, KEYPORT Provident Life Insurance Company, the Council for Advancement and Support of Education, the Education Foundation of Harris County, the Houston Community College System, CIGNA Insurance, Hartford Insurance Company, Allmerica Insurance Company, Texas Leaders Round Table, the River Oaks Business Women’s’ Exchange Club, the Mirabeau Lamar High School Alumni Association, and the Galveston Historical Society. The Houston Alumni Center is home to the Elizabeth D. Rockwell President’s Suite. In September 1997, the Elizabeth D. Rockwell Career Services Center was opened in the UH Bauer College of Business. Ms. Rockwell co-sponsored The Capitol Report on legislative activity shown on KUHT-TV. Rockwell also endowed the Chair for the Dean of the M. D. Anderson Library and committed to endowing Chairs for the Deans of the College of Education and the Cullen College of Engineering. Since the early 1990’s, she qualified to be a member of the Million Dollar Round Table and the Texas Leaders Round Table. She also authored a monthly column for the Houston Chronicle. Elizabeth is listed in the current editions of Who’s Who in the South and Southwest; Who’s Who in finance and Industry; Who’s Who of American Women; and Who’s Who in the World. Elizabeth attended public schools in Houston before attending Rice University and the University of Houston, where she majored in Business Administration and Accounting.